Jeanine Basinger's books have been among my very favorites since I started reading about film history as a teen in the '70s. Her titles on Gene Kelly, Shirley Temple, and Lana Turner were among my favorite entries in the Pyramid Illustrated History of the Movies, and since that time I've enjoyed other Basinger books including THE STAR MACHINE and A WOMAN'S VIEW. Needless to say, I was thus very happy to receive an advance review copy of her latest book, I DO AND I DON'T: A HISTORY OF MARRIAGE IN THE MOVIES. Basinger set out to examine marriage in the movies and was somewhat surprised to discover that relatively few films focus directly on the marital relationship. Movies often cover romance and courtship, but don't focus deeply on the "happily ever after," or whatever else may happen after marriage. Many films, of course, feature married couples, but Basinger found many of those movie marriages incidental to other, more dominant storylines. 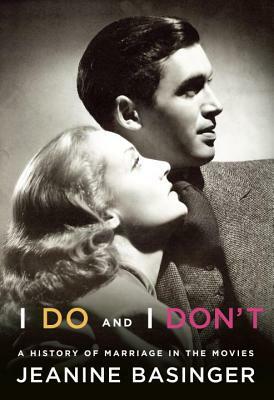 In I DO AND I DON'T she narrows her focus to those films she feels are the most interesting examinations of the state of being married, offering detailed discussions of married couples and the situations they deal with, including wartime marriages, class differences, and financial problems, not to mention one spouse trying to kill the other! There are a rather amazing number of films about a husband or wife trying to kill their spouse, including THE TWO MRS. CARROLLS (1947), CAUSE FOR ALARM! 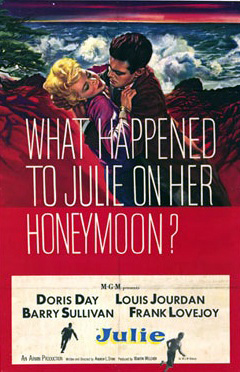 (1951), and JULIE (1956). One of the things I most enjoy about Basinger's books is her chatty, conversational tone; when I read one of her books I almost feel as though I'm enjoying a discussion about films we both love. Indeed, her style is captured by a line in her Author's Note: "It's a book for people who like movies and want to share a conversation about them." Many of the films she writes about are familiar to me, so her comments cause me to reflect back on those titles as I consider her insights, and after reading her books I also invariably end up with a list of never-seen movies to track down! 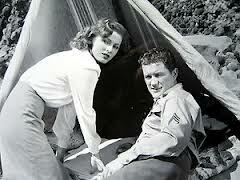 I was particularly glad to see the detailed examination Basinger gives a relatively unknown gem of a film, THE VERY THOUGHT OF YOU (1944), which starred Dennis Morgan and Eleanor Parker. She also looks at interesting but obscure films such as IN THE MEANTIME, DARLING (1944), MARRIAGE IS A PRIVATE AFFAIR (1944), and OVER 21 (1945). It's refreshing to read a serious, appreciative discussion of films which were doubtless significant to their wartime audiences but have received little attention from film historians in the years since. Basinger's books help open the door to what I hope will be future efforts by other historians to explore the American cinema to a much fuller extent, looking beyond top-shelf classics and best-known directors for the hidden gems, while also examining in greater detail the full spectrum of films available to the moviegoing public in decades past; that's something I attempt to do with the variety of films I write about here at my blog. Another really interesting film Basinger examines is FULL OF LIFE (1956), which broke new ground with its relatively realistic treatment of pregnancy. Since movies up to that time tended to cut from a woman with a flat stomach announcing happy news to the end result, a newborn baby, it was a shock for audiences when the camera pulled back in the opening scene to reveal the very, very pregnant Judy Holliday; Basinger, who worked as a theater usher as a young woman, writes that "Audiences actually gasped in the theater I worked in at the time." The majority of the book is devoted to films from the classic film era, from silents through the 1960s. 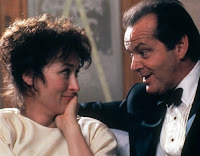 Her final chapter examines post '60s films, including one of my favorite Meryl Streep films, HEARTBURN (1983), and MR. AND MRS. SMITH (2005). I particularly enjoyed her enthusiasm for MR. AND MRS. SMITH, a film I like very much, calling it "one of the most original commentaries on marriage...ever put on film"; she draws a straight line from a crisis leading to the survival of Jimmy Stewart and Carole Lombard's marriage in MADE FOR EACH OTHER (1939) to Brad Pitt and Angelina Jolie's much different crisis spurring the salvation of their own marriage over six decades later. Basinger also spends a relatively short amount of time considering marriage on television; I found her description of the Taylors (Kyle Chandler and Connie Britton) on the series FRIDAY NIGHT LIGHTS particularly enjoyable. I DO AND I DON'T was published at the end of January. It's 384 pages and is illustrated with black and white photographs. The review copy didn't include an index, but the table of contents and a blank end page titled Index indicate one was planned; I have found an index essential in her other books for revisiting comments on movies months and years later! In addition to the hardcover copy, I DO AND I DON'T is available in a Kindle edition. Links to reviews of I DO AND I DON'T by other writers: Susan King in the Los Angeles Times, who also interviewed the author; Raquel at Out of the Past; and Aubyn at The Girl With the White Parasol. My sincere thanks to Alfred A. Knopf for providing me with a review copy of the book. Sounds a really interesting topic. Thanks for the fine review. Yet another way to enjoy and be educated through classic film. Thanks for the heads up. This book will be on my shopping list. Thanks for the link, Laura! It was nice to get your take on the book. I agree with you that the attention Basinger gives to all these relatively unknown films is one of the best parts of the book. I had quite a movie list once I finished. Again, great review! Laura - Great review! I'm glad that you liked the book. You pointed out a few things that I missed so I am definitely going to have to go back and re-read the book sometime. I really want to re-read Star Machine first though. That's a book that has stuck in my mind for quite a while. I agree with you that I Basinger's conversational tone makes the book enjoyable! Let me join the chorus of praise for Jeanine Basinger. I was entranced by The Star Machine.